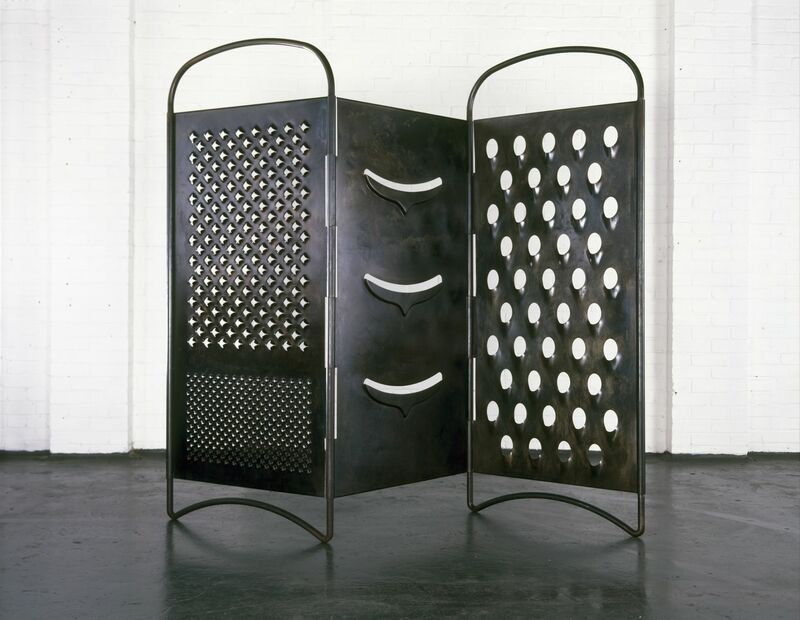 Mona Hatoum’s Grater Divide 2002 is a cheese-grater nearly seven feet high. Either it’s a kitchen utensil for giants or human beings have suddenly been reduced in stature. Or both. On the one hand, it’s laugh-out- loud funny. On the other, it’s lethal. It takes the form of a paravent or room-divider, one full of huge holes, and it demonstrates that an everyday kitchen object might be a kind of screen. What aren’t we seeing any more, if things are too familiar? It also suggests that screens aren’t just about division, they’re also maybe capable of real damage – this one could slice us into bloody shreds in seconds. Like so much of Mona Hatoum’s work, it’s a question of simultaneous thinking and feeling, and of a fused realisation, when scales shift. In the shift, unexpectedly giant forces are at play. 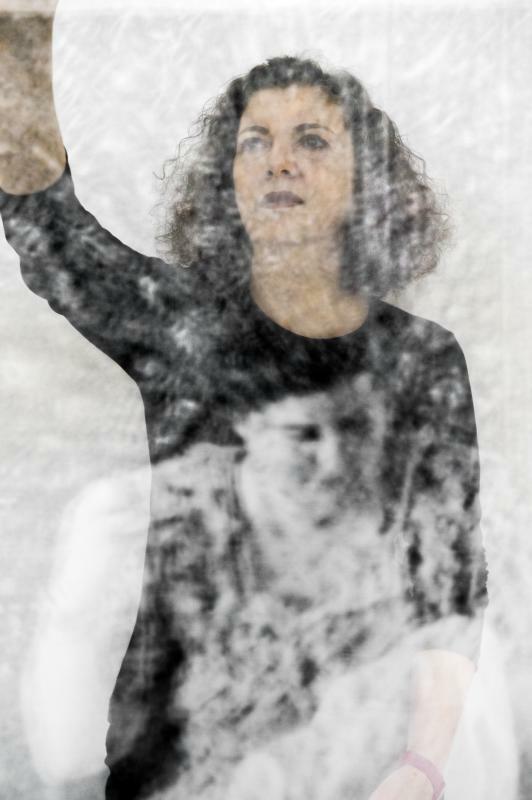 Hatoum, whose biography is historied and layered by exile, in that she is a British artist who was born in 1952 into a Palestinian family exiled in Lebanon, has been creating works for more than three decades which ask us to re-see the world, re-understand notions of territory, fragility, humanity, scale and power. Her work is about the recalibration of the forms, shapes, words, phrases, demarcations, artefacts – all the things we take as known, the structures we think we recognise, the geographies by which we imagine we know where we are. A globe shape – what does it mean? Does it make a world? How easily a world is implied, designated, tipped to one side. 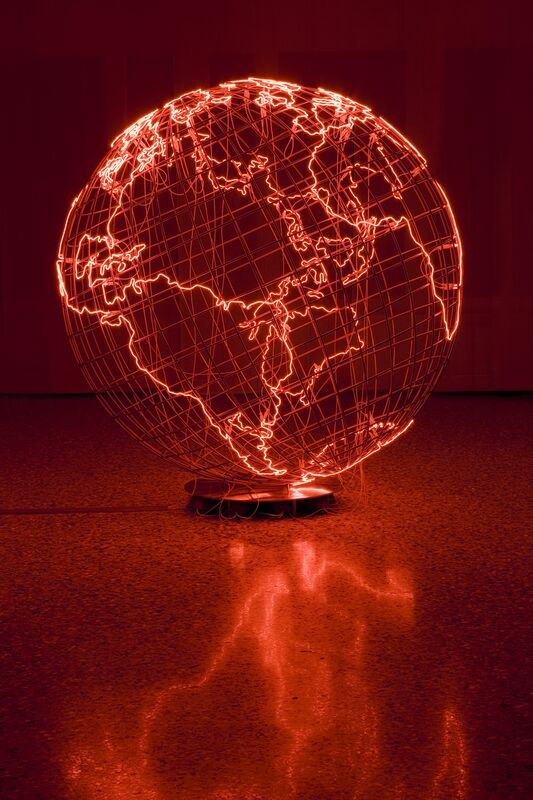 But what if the whole world is glowing a dangerous neon-red (Hot Spot III 2009)? What if a map of the world is made up of thousands and thousands of tiny glass globes (Map 1998)? Is the shape the world takes really that fragile? That unstable? What if something sets those balls rolling? Are they marbles? Is the mapping of the world some kind of fragile game? Her works create liminal space that has the capacity to blast those who encounter it into a renewed state of visceral hereness, one where concepts such as abject and natural, clinical and filthy, droll and terrifying, threatening and innocuous, industrial and humane, political and aesthetic, exist as symbiotics, parts of each other. They call to mind seminal passages in Elaine Scarry’s The Body in Pain: The Making and Unmaking of the World 1985, where the rooms human beings mundanely inhabit can be turned against them by their torturers, so that a lived-in room becomes itself part of the torture: walls, ceilings, windows, doors, door handles, tables, chairs, light fittings, baths, fridges, filing cabinets, even ‘family-sized soft drinks bottles’, all ‘converted to weapons’, and ‘in the conversion of a refrigerator into a bludgeon, the refrigerator disappears; its disappearance objectifies the disappearance of the world… it is the very facet of its disappearance, its transition from a refrigerator into a bludgeon, that inflicts the pain’. But at the same time Hatoum conjures the powerfulness of playfulness in the face of all the absolutisms and determinisms, a state of possibility and creativity, voiced, for instance, in a book such as Johan Huizinga’s Homo Ludens 1938, where playfulness creates a different order, and where, when modern warfare is a disconnect from the deeply human and spiritual act of play, Huizinga takes pains to show, like Hatoum does, that ‘real civilisation cannot exist’ in its absence. 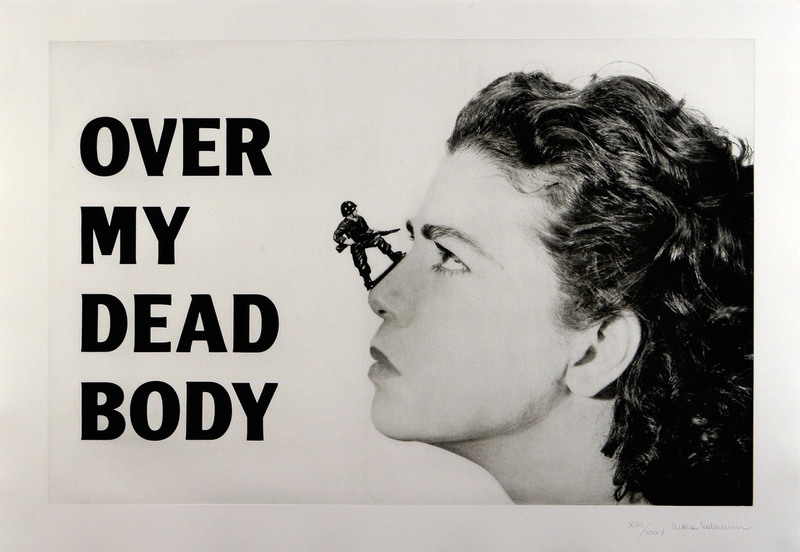 In Over My Dead Body 1988–2002, in a literal face- off, Hatoum balances a tiny toy soldier on the bridge of her nose, the bayonet pointing at her forehead. War is reduced in a single image to a near-nothing in the face of such defiance. In Misbah 2006, the very title, the Arabic word for the light that shows the way, is a play on words – and the light that’s thrown out by the artwork on to the walls of a dark room, as if by a children’s nightlight or an improvised oriental lantern, through the cut-out forms of soldiers and explosives, plays on the modern light-show that war is, the closeness of war to comfort, to entertainment, and how close to home, how deep in our homes it is, how foully such images play light. Wordplay, multiple resonance and multiple meaning run all through Hatoum’s use of language. 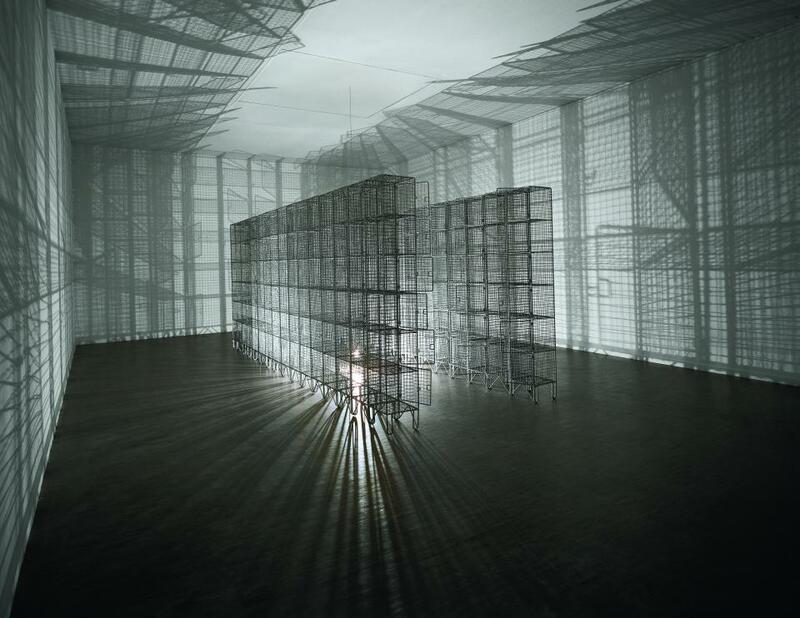 Light Sentence 1992 puns in both its title and its form on cages, prisons, electricity and a forced weightlessness in the world – ‘the feeling of not being able to take anything for granted, even doubting the solidity of the ground you walk on’, as Hatoum put it in an interview in 1997. Likewise, the two versions of You Are Still Here 2006 – with exactly these words of its title engraved on their mirrored surfaces, one elegant in Arabic, one more perfunctory in English – act as stimulus to a layered existential kind of reflecting as well as literal reflection. After all, are these words proof that you’re ‘here’, or alive? A reminder that you won’t always be? A reassurance? An admonition for your not having moved on already? An answer to a question you didn’t even know you were asking, in a casual glance at yourself in a mirror on a wall? She often deals in household stuff, chairs and cots and kitchen things, pasta, glass. In Drowning Sorrows (wine bottles II) 2004, a scatter of wine bottles seems to be sinking through the floor as we watch, as if the floor is quicksand. Or Marble Slicer 2002, a giant-sized egg slicer capable of slicing through stone, suggests that transformations are possible, that there are untapped powers of sharpness everywhere in the everyday. Her deceptions on the eye can be merrily confrontational, defiant, tragic, or all of these at once. In Mobile Home 2005, a pulley system keeps a series of household objects – a bed- roll, table, chair, cup, plate, child’s toy, washing on a line, plastic basin, suitcase, inflatable slightly deflated see-through globe – always on the move. It’s unbearably – yes – moving. It’s a singular vision of an everyday deflating of millions of people’s worlds. It’s a vision of our triviality, our briefness, and of the ways in which all human beings are reduced and unfixed by histories and circumstances which reduce, unfix and unhome any of us. ‘In the age of migrants, curfews, identity cards, refugees, exiles, massacres, camps and fleeing civilians,’ as Edward Said wrote, Hatoum’s is an art of ‘belligerent intelligence’, one that’s ‘hard to bear’ and necessary, one that offers ‘neither rest nor respite’. Certainly there’s no resting on a Mona Hatoum Daybed 2002 – wake up! Since her earliest works, such as Self-Erasing Drawing 1979, where one arm makes eternal circles in a small box of sand while the other attached directly opposite a moment later smooths the circles away again, she’s been examining the creative and the destructive drives in the human state. Again and again she reveals the extremes of human capacity, how every day in the world we’re strung between a state of torture, pain, the inflicting of pains, and a state of eye-opening creativity. One state is lethal. The other’s all we’ve got. It’s fierce, it’s shared, it’s a mobile home in itself, and – if we’d let ourselves rewrite the world – it’s a kind of heroic. 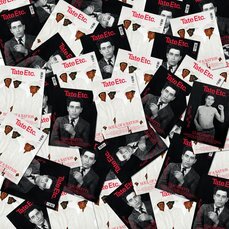 Mona Hatoum, supported by AGC Equity Partners, Tate Modern, 4 May – 21 August, curated by Clarrie Wallis, Curator of Modern and Contemporary British Art, Tate, with Assistant Curator Katy Wan, and Christine Van Assche, Honorary Curator, Centre Pompidou, Paris. The exhibition is organised is by the Centre Pompidou, Musée National d’Art Moderne, Paris, in collaboration with Tate Modern and the Finnish National Gallery/Museum of Contemporary Art Kiasma, Helsinki. Ali Smith’s latest novel is How to Be Both (Hamish Hamilton 2014). Her latest collection of stories is Public library and other stories (Hamish Hamilton 2015).